Eminent Shaykh of the Naqshbandiya Tariqa and Islamic Scholar from Kurdistan. Shaykh Muhammad Masum (ra), grandson of renowned Shaykh 'Umar Ziauddin (ra), was the last of his Naqshbandi spiritual sublineage. 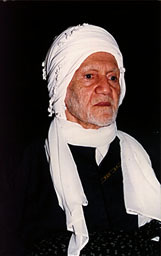 He was born in Biyara, Iraq, and completed his Islamic theological study under the guidance of renowned scholars Upon completion of his studies, he was granted the permission to serve both as a guide and teacher in both the Qadiri and Naqshbandi Sufi lineages by his renowned uncle, Shaykh Ala'uddin Naqshbandi, the last of the great masters (khwajagan) mentioned in the Naqshbandi litany, Khatm-i khwajagan. In the 1940's Shaykh Muhammad Masum (ra) was granted an official teaching certificate in the Islamic religious sciences from the Iraqi Ministry of Awqaf. Shaykh Muhammad Masum (ra) spent the major part of his life in the city of Mahabad, Iran, and left Iran at the time of the 1979 Iranian revolution. After going to Europe and Iraq, he eventually migrated to the United States in 1991. There he continued to inspire, educate, and inform people about the universal message of Islam to the end of his days as an esteemed spiritual guide. Shaykh Muhammad Masum (ra) was the spiritual guide of the Naqshbandiyya Foundation for Islamic Education (NFIE) for several years. As a highly influential spiritual guide and Islamic scholar renowned for his depth of spiritual wisdom, Shaykh Muhammad Masum (ra) radiated a sincere, humble, and uncompromising piety like that of the Prophet Muhammad (pbuh). This extraordinary, yet down-to-earth man transformed the lives of people meeting him for over six decades. He himself was the living example of the hadith saying, "The learned scholars of my community are the heirs of the prophets." Shaykh Muhammad Masum (ra), left this world one year ago, leaving his loved ones and followers with a vacant place that cannot be filled. He was an exceptional spiritual figure who faithfully trod the path of his forefathers, who in turn upheld the highest principles in the most difficult of circumstances. This is a legacy that has continued for over a thousand years and which has transformed the lives of many. In this present age there seem to be very few who can match the impeccable faith in God, undisputed moral virtue, and depth of spiritual wisdom that their exemplary forefathers have embodied. May Allah bless us with the knowledge and ability to follow the path with a faithful adherence to the Sunna of our beloved Prophet (pbuh). All praise is due to Allah alone. Peace and blessings be on our Prophet, Muhammad (Allah bless him and give him peace), his family, and companions. al-Imam al-Rabbani al-Shaykh Ahmad al-Faruqi ( d. 1624).